No posts for a while since I’ve been away on holiday to Western Australia. We spent three days in the Margaret River wine region and came back with 8 bottles of wine – which will no doubt be featured here eventually. Today we have one of them, plus a wine from New Zealand. 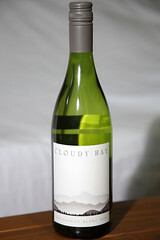 First up, it’s the 2009 Cloudy Bay Sauvignon Blanc, from Marlborough in NZ. Everything I’ve read about Sauvignon Blanc says that the best examples come from New Zealand, and everything I’ve read about NZ Sauvignon Blanc says that the best examples come from Cloudy Bay. So logically, this must be the best Sauvignon Blanc in the world. Thankfully, unlike other examples of absolute top quality wines, this one doesn’t cost a fortune. Sauvignon Blanc, as I’ve learnt, is at its best when very young – it simply doesn’t improve with age. So the best SB you can get is the most recently marketed one, and you should drink it as soon as possible. Which means there’s none of that mucking about with cellaring and letting the bottles get old and musty until you end up with 30 year old wine that costs a fortune. Nope. You can buy a bottle of the best Sauvignon Blanc in the world for about $40. And given that chance, why not try it? I’ve had a SB before – the Mystery Creek bottle I reviewed. That was nice, but this was considerably nicer. We took it to a Thai restaurant, and ordered fish dishes. The tanginess complemented the Asian chili spices and the fish very nicely. Even M, who hadn’t liked the Mystery Creek SB, enjoyed the Cloudy Bay. The aroma was very similar to me, with tropical and citrusy fruit, dominated by a limey tang and that indefinable “sauvignon blanc” smell that I’ve begun to recognise. In the mouth it was simply delicious. Tangy, zesty, acidic, with lime and gooseberry flavours. It was obviously more refined and smoother than the Mystery Creek, but without losing any of that wallop of flavour. It really was gorgeous. 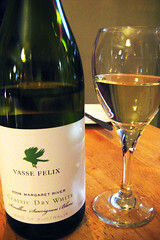 Our second offering is one of the wines brought back from Margaret River. We visited the Leeuwin Estate and did a guided tour of the winery, followed by a full tasting of their entire range of wines (9 in total). I ended up buying three bottles, with the Riesling being one of them. The “Art Series” is Leeuwin’s premium series of wines and they commission original artwork by well-known Australian artists to adorn the labels. The originals hang in a small gallery in the winery, and we saw those too. The label of this one is by John Olsen, whose best known work is Salute to Five Bells, a large mural adorning the north foyer wall of the Sydney Opera House concert hall. We had this wine again with spicy Asian food – this time Malaysian – and it suited it again. 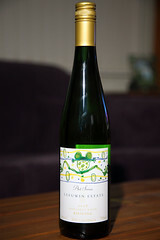 It has the typical “riesling” aroma, of industrial chemicals with a single piercing high note of citrus. It’s a well-balanced flavour, dry and fruity, with that stony, minerally quality that is hard to describe otherwise. It was not as good as the Cloudy Bay SB, but still lovely with the spicy food. 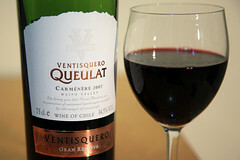 Here’s one of the wines we bought yesterday – we cracked it for dinner with lasagne. 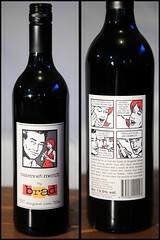 This is an inexpensive cabernet sauvignon/merlot blend from “Brad” in Western Australia’s Margaret River region. M. was drawn to it by the admittedly catchy pop art labels. The back label claims tastes of dark chocolate and plummy blackcurrant with a touch of mint. I couldn’t detect any chocolate notes at all, but I got plum and blackcurrant, and a faint hint of mint in the aroma, though not the flavour. Red wines are really difficult to wrap my head around. I’m more confident in picking the differences between various whites and identifying some of the flavour components, but the overwhelming taste I get from most reds is still “red wine flavour”. It’s really hard work dragging out something identifiable as the various fruity flavours that the wines claim to have. I can tell this isn’t spicy, like a shiraz, and that it’s probably one of either cabernet or merlot (or a blend) based on comparison to others I’ve had before, but actually identifying the specific flavour notes is really really hard. I fear I’m a bit biased by the labels on the back of the bottles, which usually claim something like blackcurrant or strawberry or whatever, and I just sip the wine and nod, and go, “uh, huh, yeah, I can taste that.” I’m trying not to, but it’s hard knowing how much that’s influencing me. At least with this one I can positively deny being able to taste anything resembling chocolate! But anyway, the label art is cool.